A long-running dispute about how fast our universe is expanding just became even more entrenched. New and more precise measurements of stars in the Large Magellanic Cloud, a satellite galaxy of the Milky Way, have only strengthened the differences between two independent methods of calculating the expansion rate. This impasse may soon force cosmologists to reexamine the “standard model” of cosmology, which tells us about the composition of the universe (radiation, normal matter, dark matter and dark energy) and how it has evolved over time. 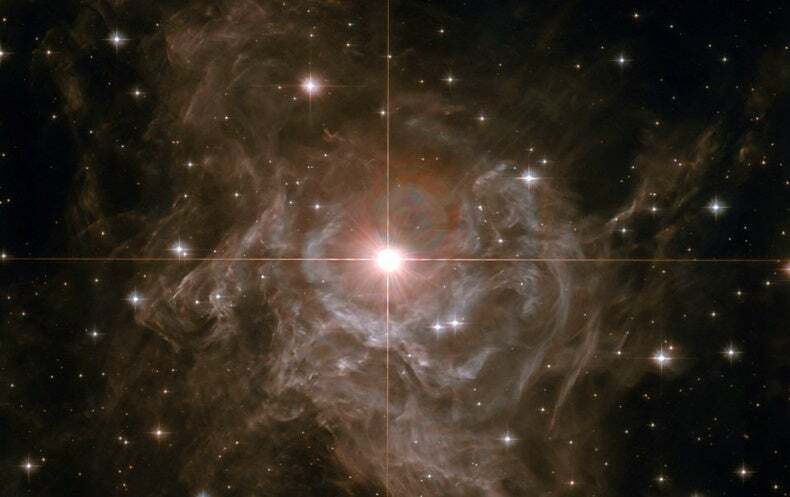 For about five years now, two projects have been at odds over the value of the Hubble constant (H0), the rate at which the universe is expanding. One relies on studies of the cosmic microwave background (CMB), the relic afterglow from the hot, dense plasma that suffused the universe shortly after the big bang. The other project uses a potpourri of more “local” measurements, which constitute the so-called cosmic distance ladder. One of the ladder’s first rungs is composed of astronomical measurements of pulsating stars called Cepheids, either in the Milky Way or in the neighboring Magellanic Clouds. These stars exhibit a correlation between their periodic pulsations and their luminosities, making them excellent “standard candles” for gauging intergalactic distances. Subsequent rungs rely on other, more luminous, standard candles. Together, these disparate data sets comprise the cosmic distance ladder, and minor errors can accumulate to distort measurements. Last week, Grzegorz Pietrzyski of the Nicolaus Copernicus Astronomical Center of the Polish Academy of Sciences in Warsaw and his colleagues reported the most precise estimate of the distance to the Large Magellanic Cloud (LMC) ever made. They used 20 star systems called detached eclipsing binaries to calculate the distance to the LMC and found it to be 49.59 kiloparsecs (one kiloparsec equals 3,261.56 light-years, making the LMC just under 162,000 light-years away). Nobel laureate Adam Riess of Johns Hopkins University, the leader of the Supernovae, H0, for the Equation of State of Dark Energy (SH0ES) project, was awaiting these results. “In expectation of that, we have been observing Cepheids in the Large Magellanic Cloud directly with the Hubble Space Telescope,” Riess says. For those measurements, they relied on a new technique of gyroscopic control to guide and point the telescope far more precisely than before. This approach, combined with Pietrzyski’s accurate estimates of the distance to the LMC, helped the SH0ES team to refine their calibration of the periodicity-luminosity relation of Cepheids. Riess and his team then climbed to the next rung of the cosmic ladder. They had previously used the Hubble telescope to study nearby galaxies that host both Cepheid stars and certain types of supernovae. The researchers employed the new Cepheid data to get better calibrations of the supernovae and used that to estimate distances to farther galaxies that only hosted the supernovae. The team also used other observations of the local universe—focusing on beaconlike emissions from around a supermassive black hole in the galaxy NGC 4258, as well as additional precision measurements of Cepheids in the Milky Way—to further sharpen Cepheid and supernovae distance estimates across vast intergalactic ranges and to estimate H0. After combining these measurements, the SH0ES value for H0 comes out to be 74.03 ± 1.42 kilometers per second per megaparsec. “It’s certainly impressive how many different ways there are to get to a very similar result, suggesting a single-point failure is getting unlikely,” says Antony Lewis, a cosmologist at the University of Sussex in England, who is not part of the SH0ES team. This latest SH0ES result is the first time that the same telescope—Hubble—has been used to study both the Cepheid variables in the Large Magellanic Cloud and the Cepheids and supernovae in other host galaxies. Previously, only ground-based telescopes had been used to study the LMC’s Cepheids—and the systematic differences between telescopes led to greater uncertainties in distance estimates. “Now we have taken that step out, and the overall uncertainty in the Hubble constant has gone to 1.9 percent,” Riess says. This is down from the previous uncertainty of 2.4 percent. So the measurement of H0 remains at odds—but now with greater statistical significance—with estimates derived from the European Space Agency’s Planck satellite, which studied the CMB between 2009 and 2013. Emitted about 380,000 years after the big bang, during what’s known as the era of recombination, the CMB is routinely used by cosmologists to calculate the universe’s size, age, composition, evolution and more. For Planck’s measurements of H0, the satellite performed precision measurements of tiny variations in the temperature of CMB photons across the sky, pinning down the angular size of so-called hot spots, which, via a chain of assumptions no less complicated than those for the cosmic distance ladder, correlates to the expansion rate of the early universe. Planck team members then used these measurements to calculate an estimate of H0 at about 67.4. Stumbling Toward a New Cosmology? Chen and her colleagues have been working on calculating H0 using data from binary neutron star mergers that can be observed simultaneously by LIGO and other telescopes. With one such detection so far, made in August 2017, the LIGO team estimates H0 to be about 70, but that estimate’s uncertainties are large enough to accommodate both the Planck and SH0ES results. If LIGO’s numbers end up supporting SH0ES, then the assumptions that go into Planck’s estimates of H0 will have to be questioned. Lewis, a member of the Planck collaboration, thinks that there are two reasons why the Planck estimate could change and come closer to SH0ES: either the physics of the early universe was different, in a way that somehow changes the predictions for the angular size of the CMB hot spots, or the universe’s more recent evolution is not quite the same as that predicted by the standard model of cosmology. Either scenario would demand significant revisions to the standard model, but according to Lewis, tweaks to the universe’s recent evolution would be hard to reconcile with its known large-scale structure and seemingly solid observations of supernovae. “The exciting thing is that if the discrepancy is due to new physics prior to recombination, it will almost certainly have distinctive signatures,” Lewis says. The signatures would show in the finer details of the CMB—something that the next generation of CMB telescopes, such as the upcoming Simons Observatory, could see.